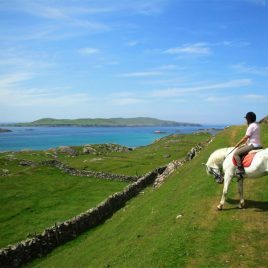 Inishbofin Equestrian Centre is the only equestrian centre on any of Irelands offshore islands. Inishbofin Island is renowned for its magnificent panoramic views of the surrounding islands, the Connemara coastline, Twelve Bens Mountains and as far away as Croagh Patrick. By taking a trek with us you get to see the island from a totally different perspective while you relax and get a chance to absorb the beautiful scenery that is all around you and hear about the history, flora and fauna of the landscape.